In early April, and a month on from Miko-chan telling the sad tale of how she came to be lost, Kiku the little fox was sitting in the garden with his best friend, where the days were becoming brighter and warmer. “You know, Miko-chan”, he said, “You don’t have an official birthday, so why don’t we make today your birthday from now on?” The little shrine maiden doll smiled. “That would be lovely – it is in the middle of cherry blossom season, and I would always look forward to it”. So they told Boss Panda and Mama Kōjin, who wrote down April 8th as Miko-chans birthday for next year’s calendar. Boss Panda looked at the two friends, and said “how about a trip to buy some new drawing materials for your birthday?” Miko-chan loved to draw, and could often be found in a quiet corner of the Bamboo Bathhouse sketching – everything from nature to everyday items. 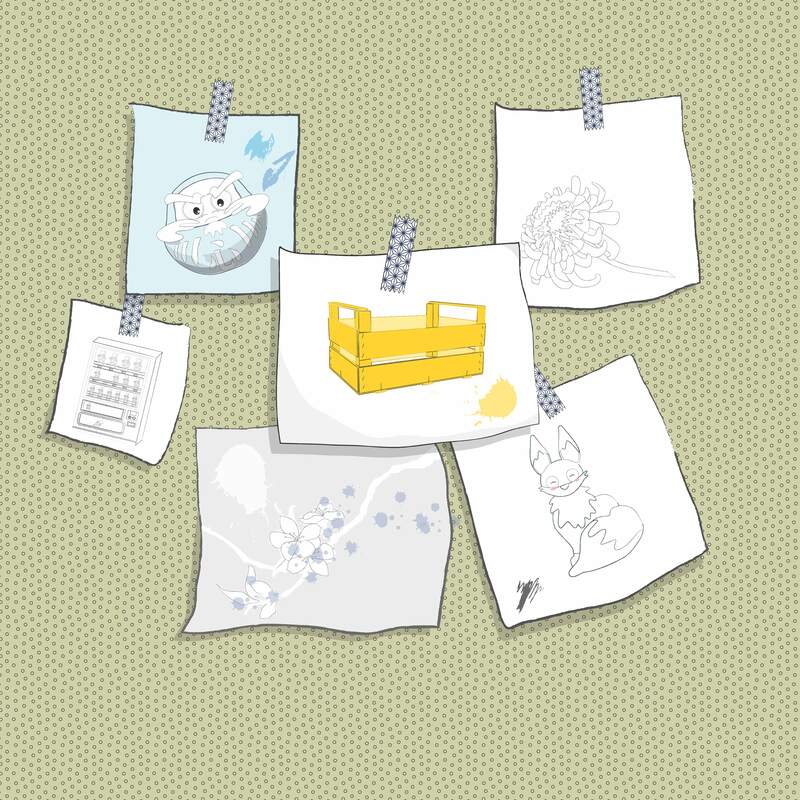 Kiku had kept a few of her discarded ones and stuck them on the wall. Miko-chan’s face lit up, “Oh that would be so nice! I have been thinking about more drawings recently, and would love to have some new pencils to draw with”. And so off they set to the centre of Tokyo, bustling with people, but everyone so busy that they never noticed the hidden characters of the city, such as the large tattooed panda and his constant companions. Kiku loved to walk the wide streets of Ginza, a district with many famous stores and a great place to watch the inhabitants of Tokyo doing something they liked best – shopping. 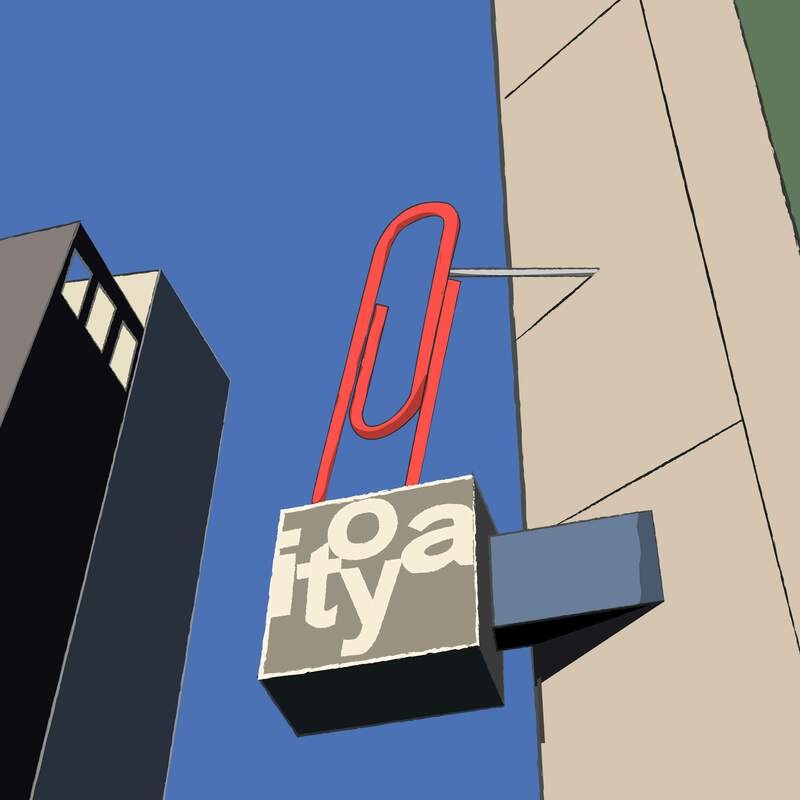 At last they came to a shop front with a giant red paperclip outside, and pencils suspended in the large glass picture window. They stood for a moment outside the store, looking at the beautiful display. Boss Panda told them “this wonderful stationery shop first opened in 1904, and has had various buildings – one was lost in the Great Kanto Earthquake in 1923, and in 1944 they had to close for two years, first because of lack of supplies during the war and then to rebuild burned down buildings. In 1965 a new head office/ flagship store was built here, and then in 2015 was reopened in this form, known as G. Itoya, after operating from a temporary store around the corner whilst the rebuilding work was taking place. As part of the rebuild, a lot of the ‘day-to-day’ stock has been moved to the more compact store in the street behind (known as K. Itoya), which used to be the fountain pen speciality store, so we will need to visit there as well – as this is where you will be able to get most of your pencils and paints”. Miko-chan’s eyes were wide with excitement. 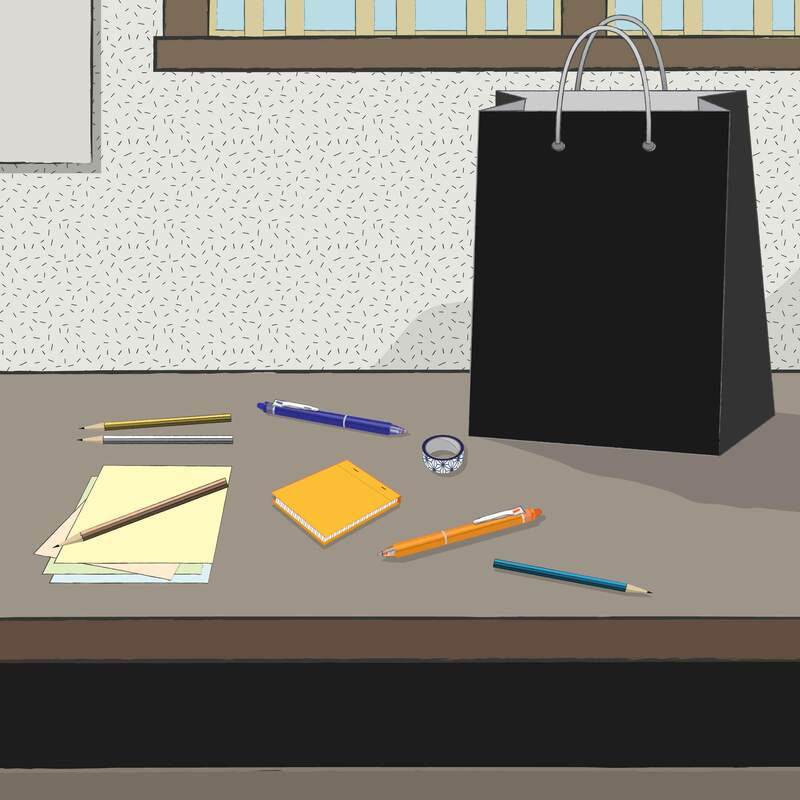 “But this is the flagship showroom, and almost a shrine to the delights of stationery. The amazing thing about this front window” the old bear continued, “is that it can turn sideways on, to make a larger entrance when needed”. Boss Panda could see that the little doll was about to burst, and so in they went. He suggested that they took the elevator to the top of the building and work their way down. 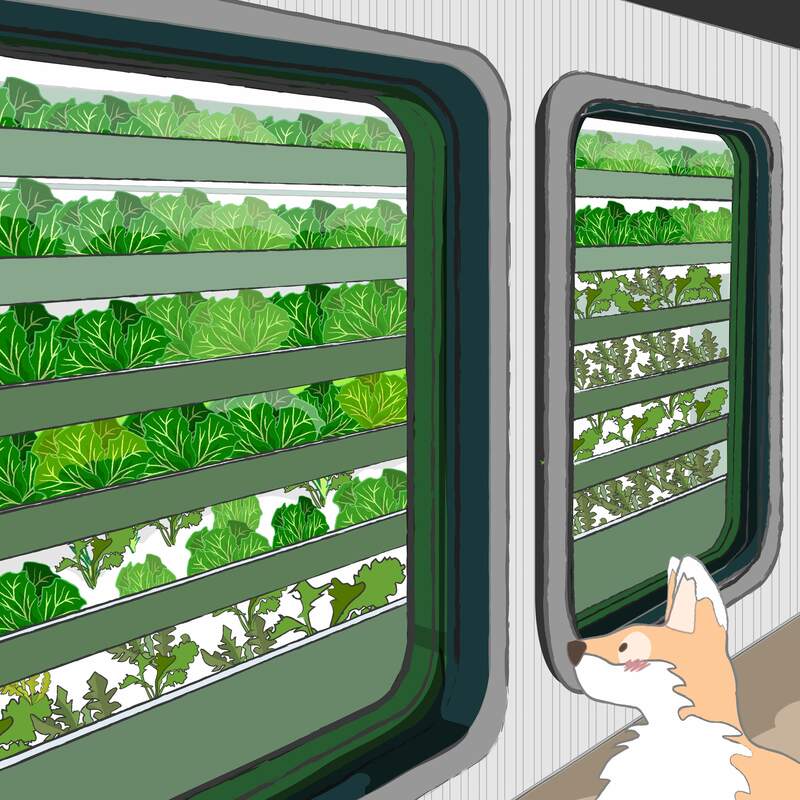 At the very top, on the 12th floor, they had a look at the lunch menu at the café, which had ingredients such as lettuce and other green vegetables grown by the employees of the store on the 11th floor farm, a hydroponic vegetable garden. On the 10th floor was a reservations only business lounge, and so they began their stationery tour on the 8th floor [8F CRAFT クラフト], which focused on wrapping and washi papers as well as stamping, origami and scrapbooking, and held regular paper craft classes. Miko-chan had fun trying out different stamps and watching a wrapping stylist at work. 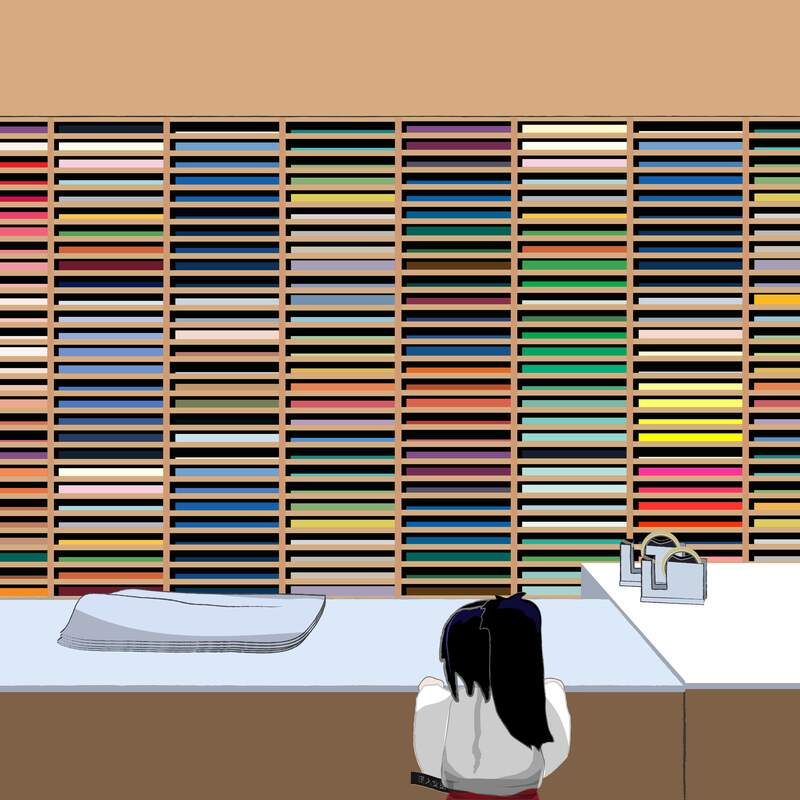 Floor 7, entitled ‘Fine Paper’ [ファインペーパー] was a paradise for colour lovers, with thousands of paper colour samples lining the walls and a ‘paper concierge’ desk for advice and help with selecting the right weight, texture, colour, surface, and thickness. 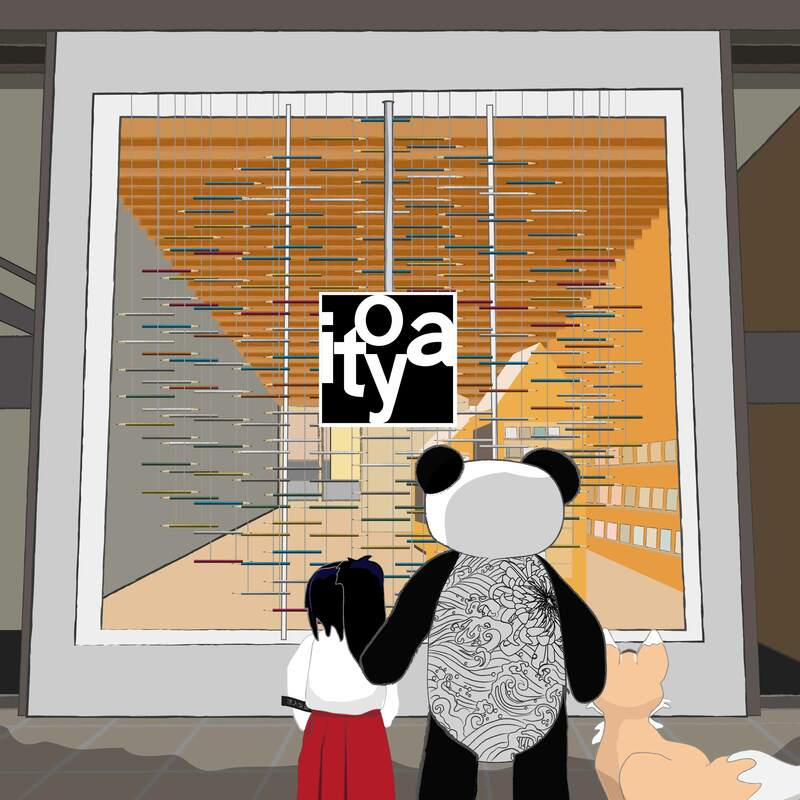 Miko and Kiku just stood for a while staring at the wall behind the concierge desk, mesmerised by the blocks of colour in the shelves of paper. Floor 6 was entitled ‘Home’ and described by the store guide as a place to organise memories, and to make creatively designed zones in five different spaces of the home: Kitchen, Dining Room, Living Room, Wash Room and Terrace. Floor 5 was devoted to travel goods such as bags and stationery for on the move, which Boss Panda seemed to enjoy browsing. Floor 4 was filled with scheduling and planning stationery – Kiku had come to know that in this increasingly digital world, Japanese people still greatly valued the paper versions of diaries, calendars and schedule books and there was a huge variety on offer for everyone from schoolchildren to business people. Miko-chan particularly liked the character diaries with little stickers to use on special date entries. When they arrived at the 3rd floor, Boss Panda explained that the fountain pen showroom that used to be mainly housed in K.Itoya around the corner had moved into the new store, where you could also bring your own fountain pens to the ‘pen care room’ for cleaning and maintenance. There were also other items to use when writing at a desk, such as writing mats and organisers. When the three friends arrived at the 2nd floor [2F LETTERレター], they had great fun selecting cards from those on offer and trying out different pens and inks to write postcards and letters and mailing them at the little store mailbox. Boss Panda told them that this was also where you could get business cards printed and personalised stationery for events such as weddings. On the ground floor [1F GROUNDグラウンド], the three friends bought a drink at the drinks counter and watched people looking at greetings cards and special displays. Miko-chan was enjoying her day so much, but was also keen to see the drawing materials in the other store, and so they left through the back entrance out into a quieter street behind the flagship store. Just to the left and opposite they entered K.Itoya which had more pens on the ground floor, but higher floors filled with pencils, paints, and materials for everything from calligraphy to print making – there was even a small woodblock print making workshop taking place on the 5th floor and the friends saw people making good fortune cards and bookmarks from scratch. 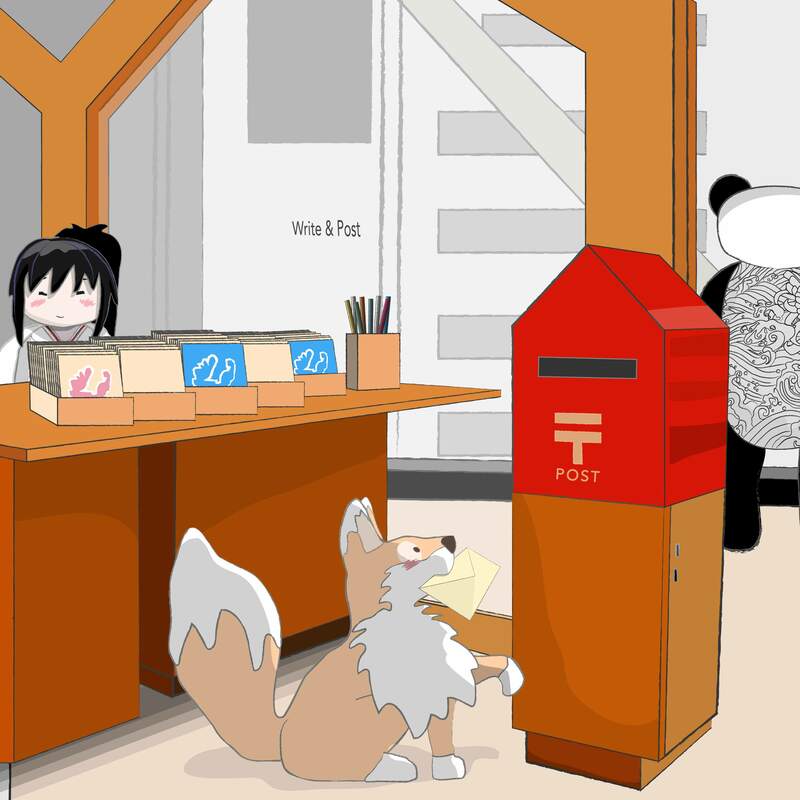 On the 2nd floor was a counter called ‘Note Couture’, where both Miko-chan and Boss Panda made their own notebooks, selecting paper, colours, cover and binding. Once all three had finished making purchases, they returned to the café on the top floor of the main store and had a delicious snack to end their day. Miko-chan looked at her two companions through very sleepy eyes and thought that her first official birthday was the best ever…. 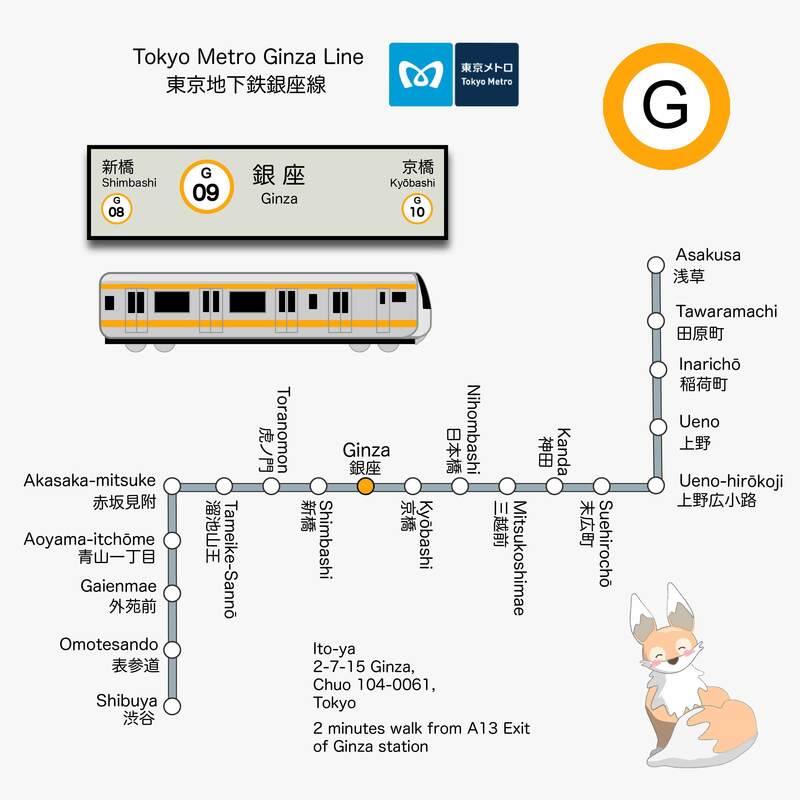 The closest station for Itoya is the Ginza station on the Tokyo Metro Ginza Line. Sundays/ Holidays 10:00 to 19:00. Cafe Stylo on the 12th floor of G. Itoya is open until 22:00 with last orders at 21:00. Oh, another wonderful story! Thank you so much for taking the time to bring a smile to my day. The last time I was in Tokyo – about 4 years ago now ( but we’re going this August!!!!) – I failed to buy a little washi card holder for my travelpass, and every time I use the ugly thing I’ve got now I want to grind my teeth. I know just where I will be buying that cardholder! Have been to beautiful stationary stores in Tokyo; but have missed this one. I can’t wait!